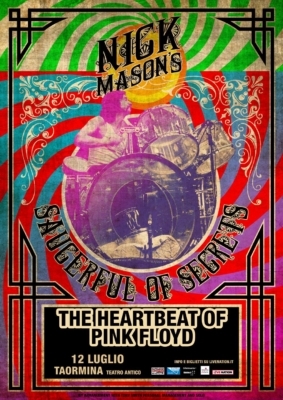 The Greek Roman Theatre of Taormina this year will host Nick Mason’s Saucerful Of Secrets: a magical place to hear the band revisit the early days of Pink Floyd’s music. Nicholas Berkeley Mason, (born 1944) is an English drummer, best known as a founder member of the progressive rock band Pink Floyd. Mason is the only Pink Floyd member to have been featured on all of their studio albums, and the only constant member of the band since its formation in 1965. It is estimated that as of 2010, the group have sold over 250 million records worldwide, including 75 million units sold in the United States. Despite solely writing only a few Pink Floyd songs, Mason has co-written some of Pink Floyd’s most popular compositions such as “Echoes” and “Time”.